2). Flame Tree BBQ – Animal Kingdom Flame Tree has some of the best barbecue at the Walt Disney World Resort, and you get a lot of food for the money. 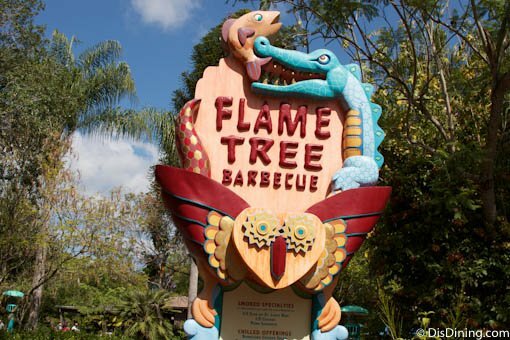 You’ll find Flame Tree BBQ at Discovery Island at Disney’s Animal Kingdom. Stop by before heading to the World of Pandora. Enjoy ribs, chicken, pulled pork, pulled pork mac-n-cheese, pulled pork sandwiches, smokehouse chicken salads, onion rings and more. Adults can eat for $15 to $20 per person, and kids can eat for under $9. The sampler plate gives you three different meats plus sides—it’s the best value on the menu at Flame Tree, but you can’t go wrong no matter what you order!